You’ve been working hard researching the business side of getting your food truck up and running: permits, licenses, zoning… but now let’s get creative! Your delicious food and exemplary service will keep customers coming back. But how do you get them there in the first place? That’s right. It’s time to start getting concrete about your food truck design. Many elements go into getting the word out about your food truck business: advertising online and with social media, presence on the street, your speed and courtesy when getting your piping hot gyros into your customers’ salivating mouths. But it all starts with your food truck branding. People make split-second decisions about food, and they plan ahead to re-live a great experience. Your name has to appeal to both audiences by standing out and being memorable. Remember, they shop with their eyes first. Revisit where it all started. 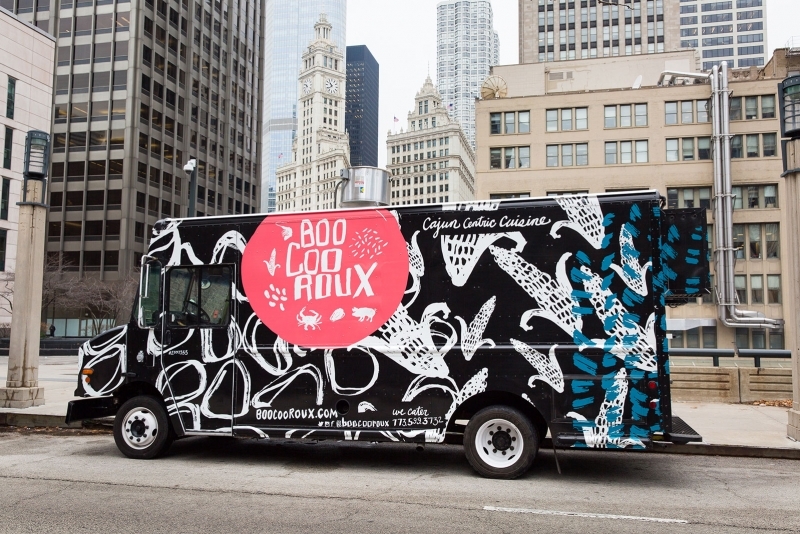 What’s your vision for your food truck’s personality? Is it playful, spontaneous, and laid back? Is it minimal and upscale? Is it excessive and indulgent? Your name should reflect your brand’s attitude as well as capture the spirit of the food. Indulge your imagination here. If your food truck were a person, what would he or she look like? What animal would she be? It sounds silly, but if you give yourself permission to be creative, you might be surprised by the results and ideas you come up with. Your name is your catch-all phrase that your food truck will live and die by. You might go with something purposefully silly. Puns like Curry Up Now and Easy Slider are catchy and work well in an urban center. Take a cue from New York’s Korean barbeque truck, Korilla BBQ, and consider joining two words together. Or go with something no-nonsense and direct like San Francisco’s Bacon Bacon. We can’t stress originality enough here. Look at what’s out there already and make your truck stand out among the rest. If you’re selling Indian fare and the market is saturated, consider a different take on it. If the others have more ethnic monikers, go in the other direction and aim to be modern and edgy. We get it. Commitment can be tough. There will be a lot of things about your business that you can change along the way. But changing your name late in the game can confuse your customers and lose you business. Find one that fits your brand and communicates your vision and you’ll claim your stake on the streets. Let’s do some creative visualization. Close your eyes, and imagine your truck on the road. You need a great visual presence. When people see it across the lot or down the block, their hearts will jump because they’ve found you and have to try your food. Your food truck logo ties into your brand’s vision and voice, collectively they should be telling the same story in a unique and interesting way. Start by researching the restaurant and food truck brands and their logos in your area. Put them in two categories: likes and dislikes. Study what’s great and what’s not so great. What works, and why is it working? And most importantly, get a sense of what’s out there so that your food truck branding will be different while still remaining true to your vision. Your food truck logo must stand out in a sea of other food trucks and needs to play a key role in the overall visual brand strategy. Make sure it’s visible when the truck is open and closed. Will it be one identifying image? Or will it take over the entire truck? Either way, make sure the food truck’s name is visible. If you can’t read it from far way, write it in a big, clear font above your window. Do you live in a big city where thousands of people peer out their skyscrapers at the world below, awaiting lunchtime? Consider getting a vinyl wrap on your roof and advertise upwards. If your brand is fun-loving and enthusiastic, go crazy with a big, funky image. If your brand is more direct, be direct and understated. 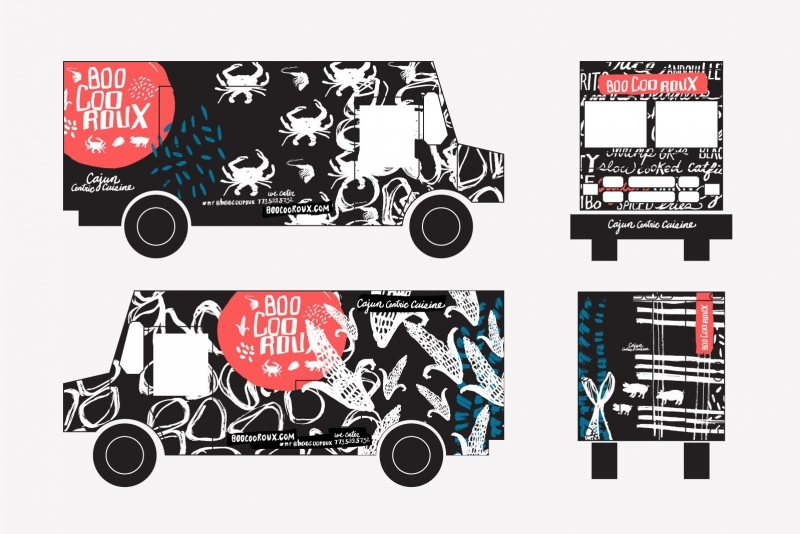 Sometimes less is more when you’re up against a lot of edgy food truck design. Logos that are clean and bold communicate consistency. Maybe your truck is tied to a brick and mortar restaurant, like Troya in San Francisco. It’s traditional and sophisticated while being fresh and modern, communicating that they’re established but contemporary. Navigating all the elements of your food truck branding can be daunting and most of us aren’t artists. Find a professional or a design studio specializing in food truck design who will work with you to bring your brand and your logo vision into reality. But most importantly – make it yours! Get inspiration from other brands, trust your designer, and keep your food truck design true to your vision. Find your own silver apple, your own golden arch. Be bold. Be brave. Get your food truck noticed.